12V DC Outlet - Charge your smart phone or cell phone with the built-in 12-volt socket. 2-pedal HST Operation - HST offers fast and smooth forward and reverse speed and direction changes via twin foot pedals that leave your hands free for steering and implement control. 4WD - Kubota's BXSeries' rugged and sturdy 4-wheel drive (4WD) provides powerful traction for the heavy-duty front-loader work and operating other implements. Bright Halogen Headlights - The halogen headlights of the BX-Series provide clear, bright illumination when working and traveling at night. Compact Body - With an overall length similar to a standard garden tractor, the BX-Series tractors are easy to drive and can work smoothly even in tight spaces. The BX-Series' compact size also means they're gentle to the turf. But don't be fooled by their compact dimensions-these tractors are powerful and capable of handling a wide range of garden and yard needs. Cruise Control - Cruise Control automatically maintains a constant speed, letting you take your foot off the forward pedal. It's the easy way to mow large areas or travel long distances. Deluxe High-back Reclining Seat - BX-Series models* now come equipped with Kubota's deluxe seat with dual armrests to keep the operator comfortable even when the job is difficult. This fully adjustable high-back seat also features a reclining back and soft cushioning to support the back and legs. Deluxe Lever Guide - The BX-Series tractors feature large angled lever guides, for hassle-free shifting, fast control lever recognition and easy operation. Easy to Read Meter Panel - A new control panel design enhances operability by placing all vital indicators on a single, easy to read panel. The new panel features a tachometer on the left and an LCD display for fuel level and coolant temperature on the right. Warning indicators for battery, headlights, turn signal, and low fuel are in the middle. With just a single glance, you get a complete picture of the tractor's functions. Foldable ROPS - Foldable ROPS are standard equipment on all models to ensure operator safety on the job at all times. Ground Clearance - The BX-Series provides plenty of ground clearance-9.0 inches for the BX1870, 8.7 inches for the BX2370/BX2670-to get you over rocks and other objects in your path. Hydraulic Power Steering - A standard feature on all BX-Series tractors, hydraulic power steering offers effortless control, thereby reducing operator stress and fatigue. Large Fuel Tank - You get more work done when you're not stopping frequently to refuel. The BX-Series' large 6.6 gallon fuel tank ensures that refueling operations don't hinder your work schedule. Metal Hood/ Fenders - Strong and durable, the BX-Series' metal hood and fenders resist dings and dents, ensuring that your BX tractor continues to look good. New Steering Wheel Position - The steering wheel on all BX-Series tractors has been repositioned to provide any operator with better steering control and greater comfort. 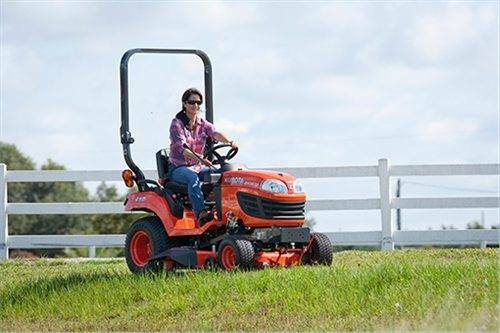 Performance-matched Kubota Diesel Engines - The BX1870/BX2370/BX2670 are powered by rugged engines built by Kubota exclusively for the BX-Series. The BX1870 and BX2370 come with 18- and 23-horsepower diesel engines, while the BX2670 packs a new 25.5-horsepower diesel engine under the hood. All three engines are 3-cylinder workhorses that offer power unparalleled for tractors this size...more than enough muscle for all your gardening and mowing jobs. Reverse Air Flow - On the BX-Series, the radiator is located in the middle of the tractor rather than at the front. Air is taken in from the operator area and pushed towards the front through the radiator. This reduces overheating, keeps grass from clogging the radiator grill, and prevents hot air from blowing on the operator. Versatile Category I 3-point Hitch - The BX-Series all feature a sturdy, hydraulically controlled Category I 3-point hitch that allows you to attach a wide array of rear implements.